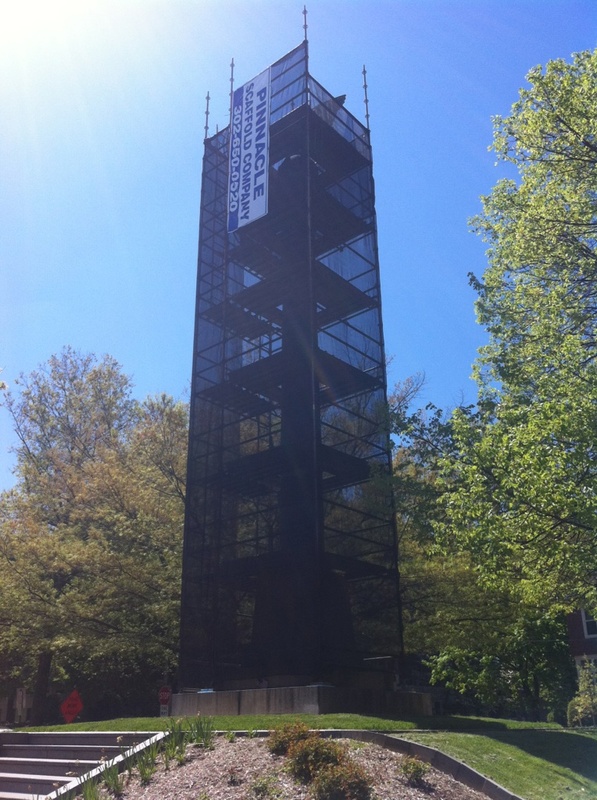 Pinnacle scaffold begins its tour of duty with Soldiers and Sailors Monument renovation, Wilmington, DE. 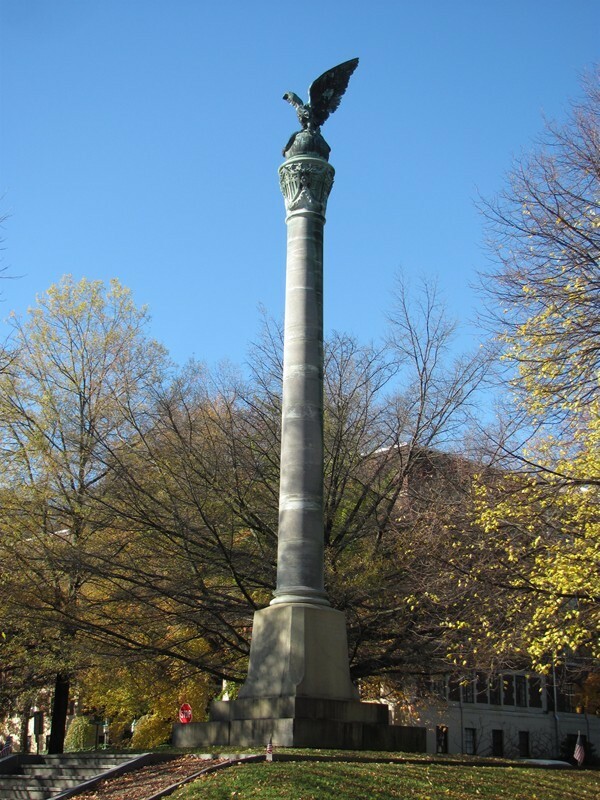 Pinnacle scaffold is proud to be serving as the scaffolding provider for the renovation of the monument Soldiers & Sailor monument erected in 1871. 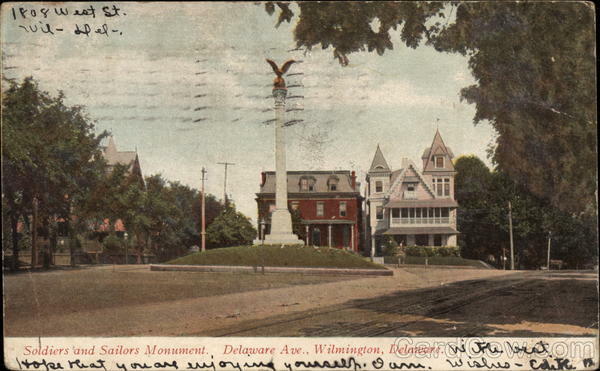 The memorial that sits in the triangle formed by Delaware Ave., W. 14th, and N. Broom street is dedicated to Soldiers and Sailors who gave their lives in defense of their country in the Civil War. 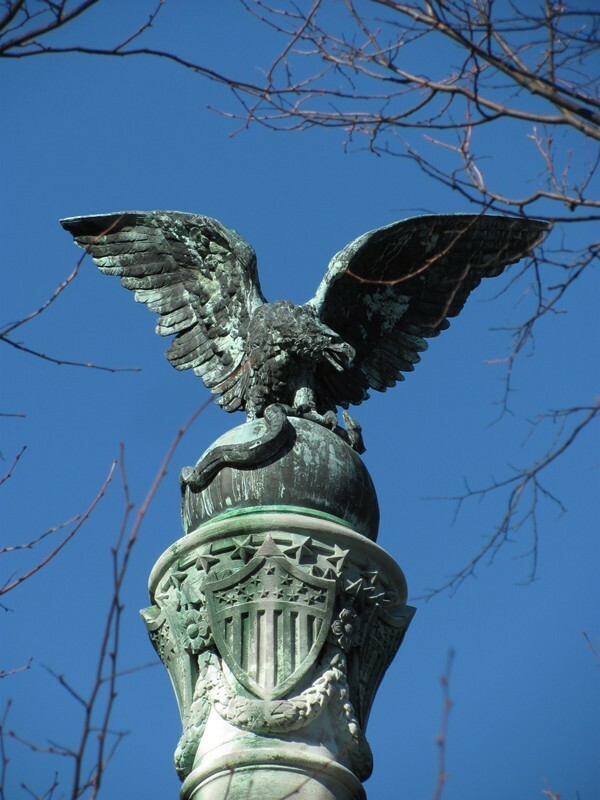 The large marble column is from the Pennsylvania Bank Building, Philadelphia that was razed in 1868. 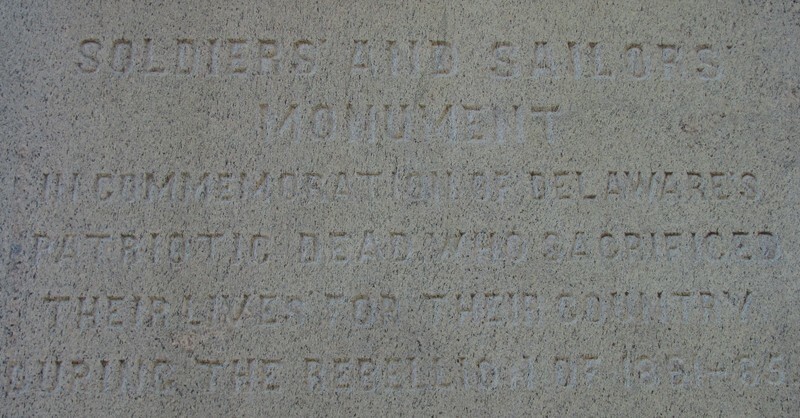 The monument itself was threatened by the sheriff after it’s unveiling because a construction debt was outstanding. 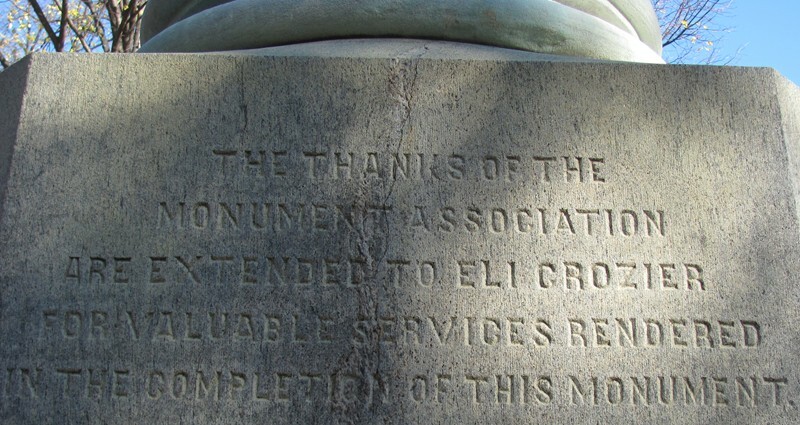 Eli Crozier, came to the rescue with the necessary funds to save it. A thank you to him is engraved in the stone on the back of the monument. Pinnacle is starting its tour of duty with this monument and then will continue to all of the other monuments in the city of Wilmington. (More posts to come). 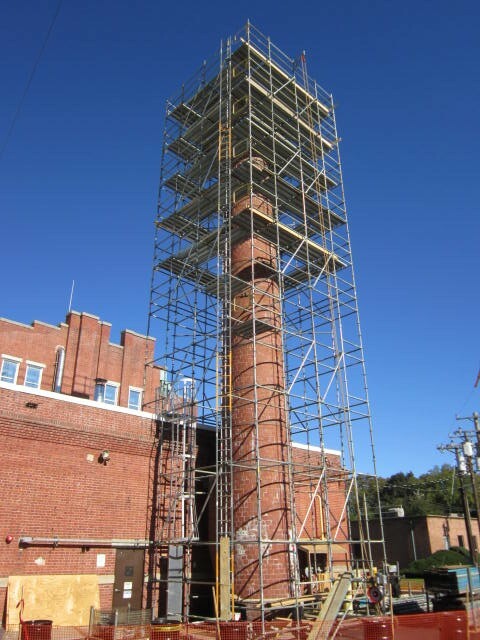 Pinnacle’s scaffolding provides access to 100% of the monument so restoration crews can get to every nook and cranny. 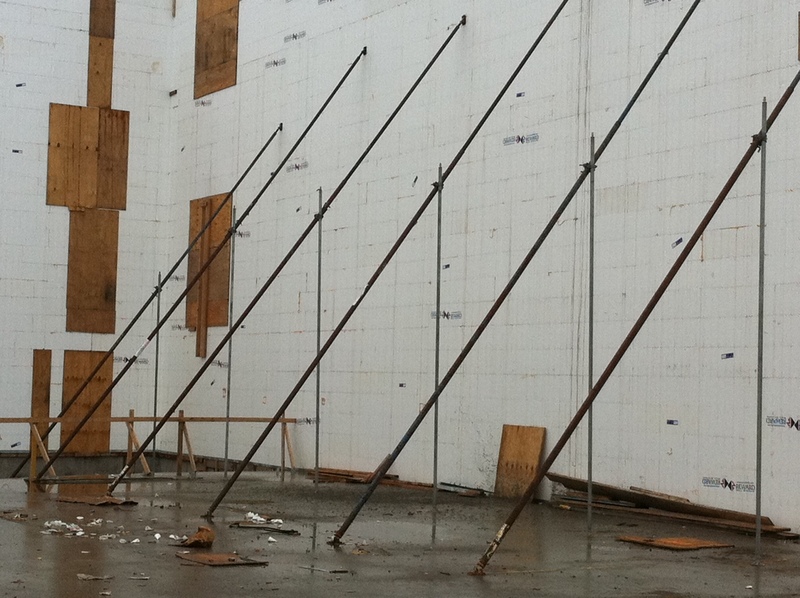 Pinnacle also devised an ingenious ladder system that goes up through the center of the scaffold. They hid the ladder in the center so local children wouldn’t climb up and either damage the statue or injure themselves. Finally, the monument was ensconced in debris netting. We will provide some photographs when the restoration is complete. The marble, eagle and placards should look as good as new once finished. 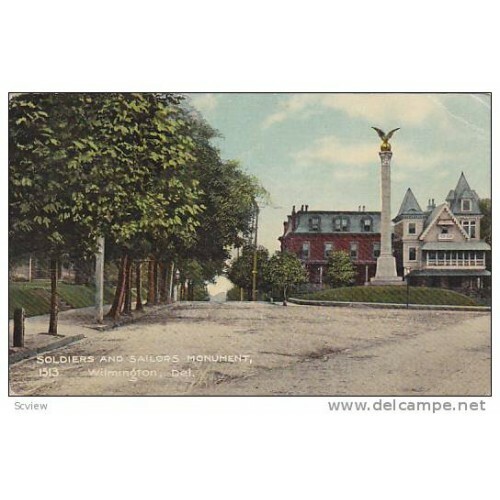 Here are a couple of postcards from the turn of the century. You can see what the original monument looked like in it’s current place. Things certainly have changed. Call Pinnacle today at (302) 766-5322. For more information visit these sites. 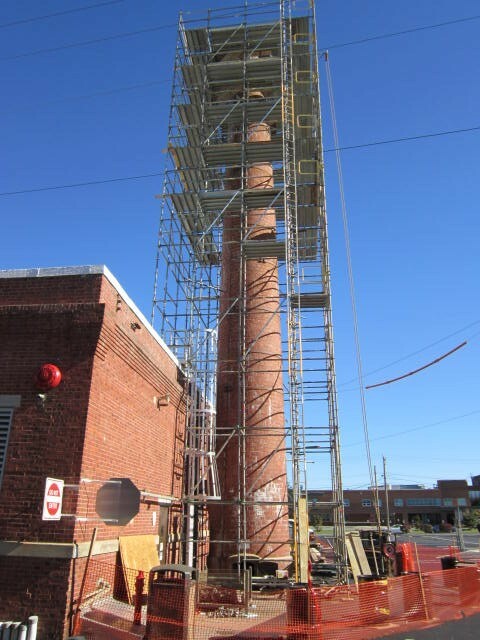 Cool Scaffolding project – Smokestack demolition in Milford, Delaware. 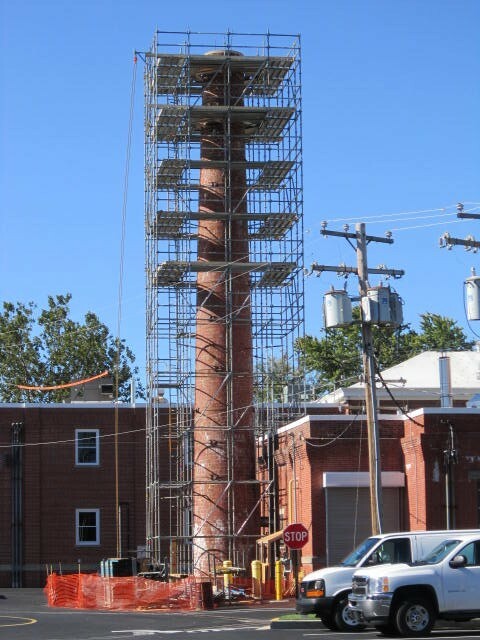 Here’s something you don’t see everyday – scaffolding for an 80′ tall smokestack demolition in Milford, DE. I just love the pics of this job. Normally, demo companies just tip these over or implode them but that was obviously not possible here because the stack is attached to the building beneath. This particular smokestack belongs to the world-wide dental company called Dentsply. 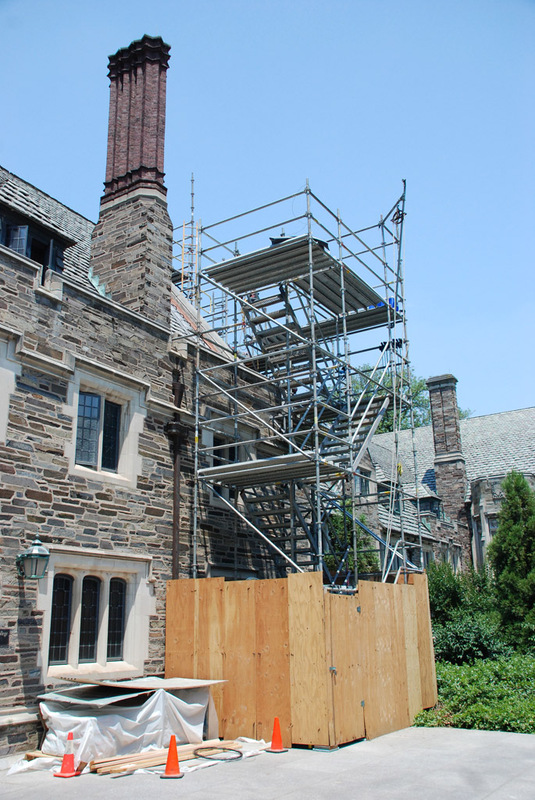 Pinnacle Scaffold was brought in because of their experience with historic buildings and their ability to build around odd shaped structures. Thanks to Clean Venture for the referral. 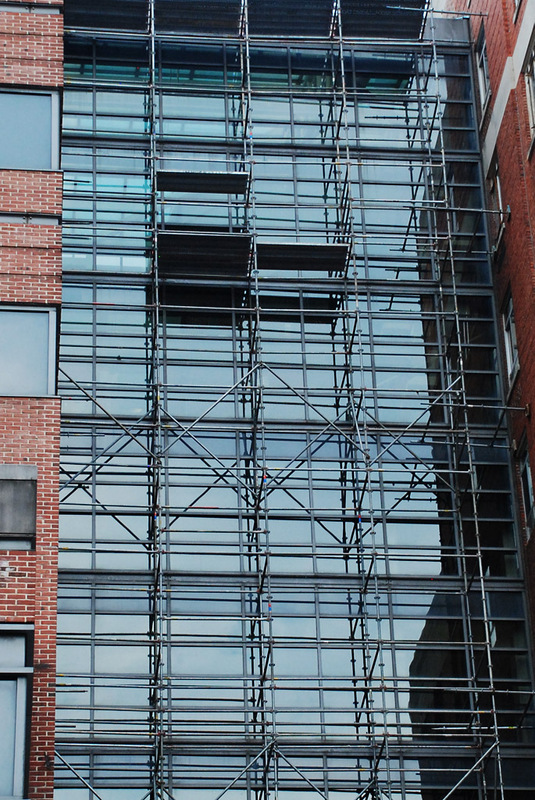 The challenge here was to have the correct architectural drawings designed and implemented on-site as the scaffold went up. 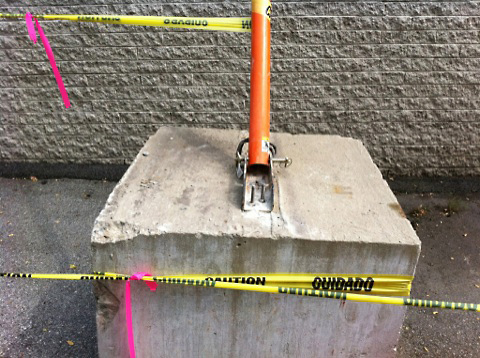 Anchor points were critical since the bulk of the structure was coming down. 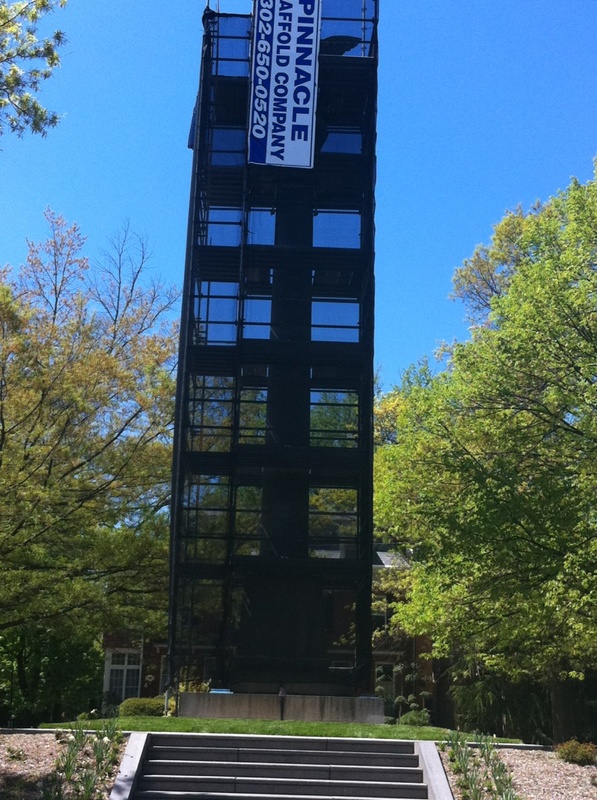 It was designed so that demolition crews could begin dismantling at the top and work their way down. 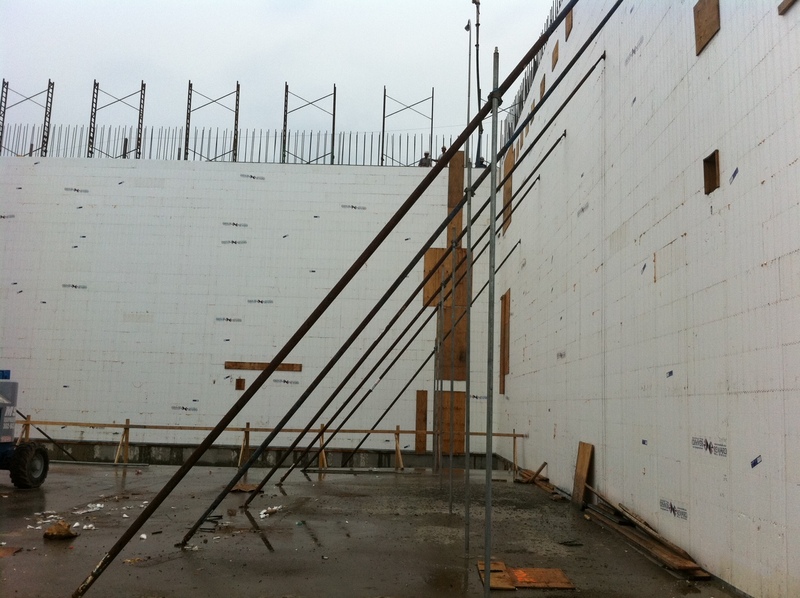 PSC has an on-site team, working in tandem with the demo crew, dismantling portions of the scaffolding as the crew moves down towards the ground. My question was, “what happens to the bricks and mortar when the crews demo the chimney?” Well, they toss it into the stack and clean it out when they reach the bottom. PSC also provided crews with several trash chutes for debris. (those came after these pics were taken). 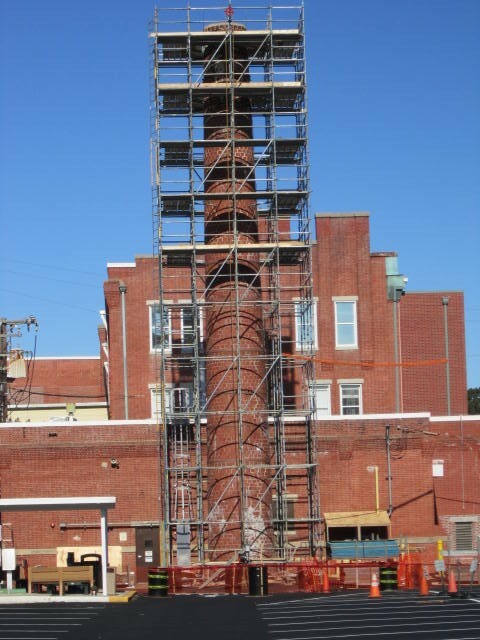 It’s not everyday you see scaffolding around a smokestack that is coming down one brick at a time. 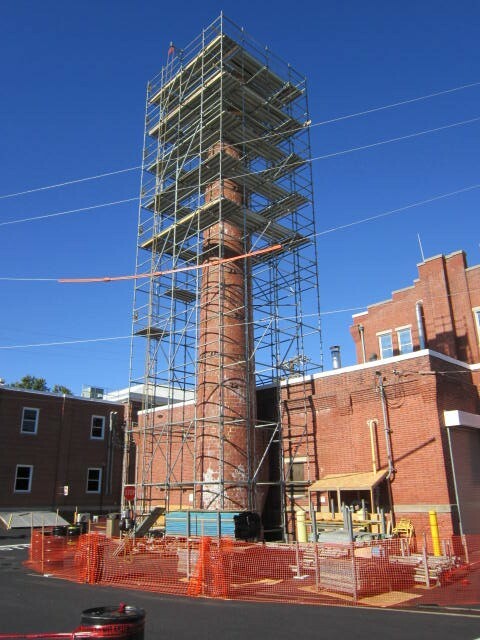 Call Pinnacle Scaffold today at (302) 766-5322. DENTSPLY International has been committed to providing the global dental community with innovative, high quality, cost effective dental products. From our humble beginnings in 1899, the Company has grown to become one of the largest professional dental products company in the world. With operations in 40 countries, the Company distributes its dental products in over 120 countries under some of the most well established brand names in the dental industry. Worldwide, dental professionals now depend upon DENTSPLY for innovative, new solutions that advance the practice of dentistry and improve oral health for patients throughout the world. Contest. Spot the workers and win! 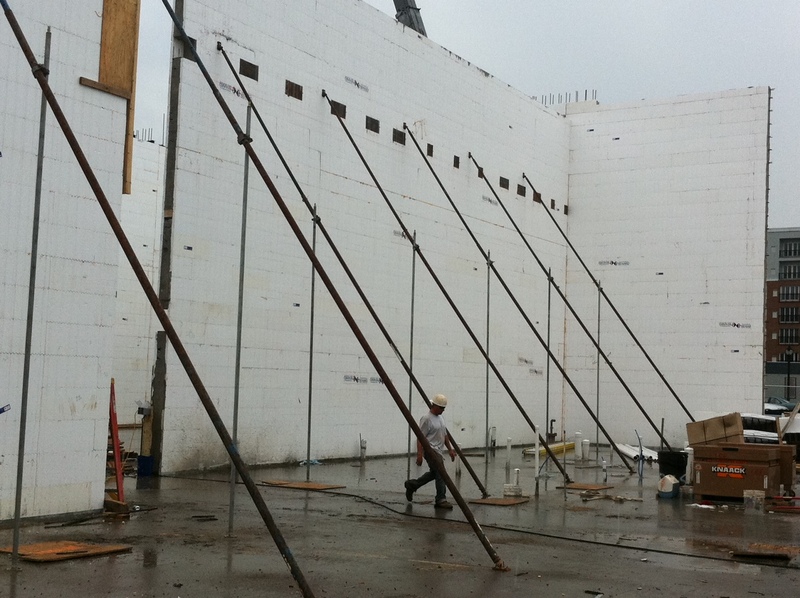 Pinnacle’s giant tilt up wall bracing contest. 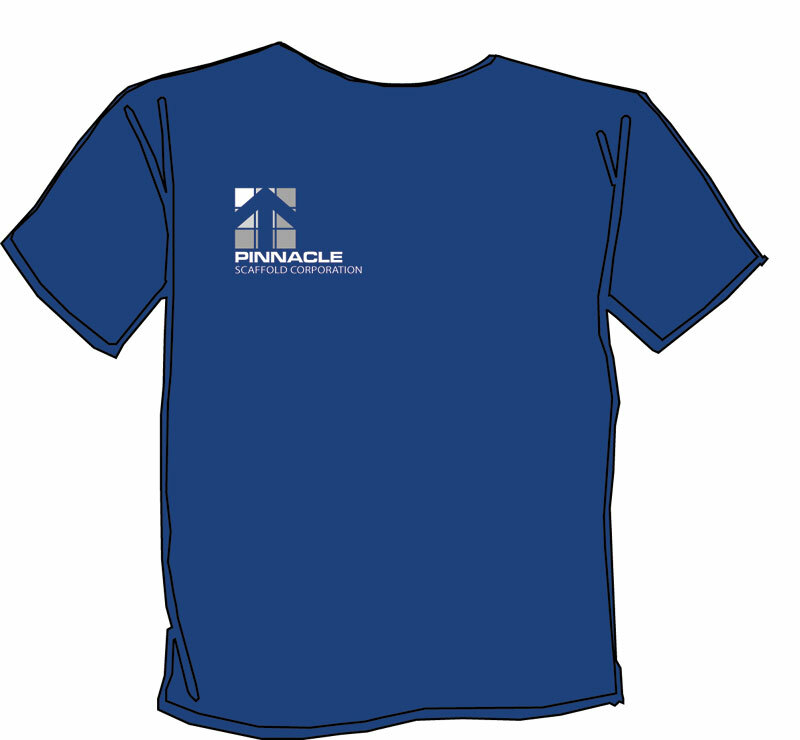 10 People could win Pinnacle Scaffold T-shirts! Like us on facebook and leave your answer in the comments. 10 people will be chosen at random from the correct responses. Good luck. Here are some new photos from Pinnacle Scaffold shoring division’s work on the new Penn Cinema IMAX theater at the Riverfront, Wilmington, DE. 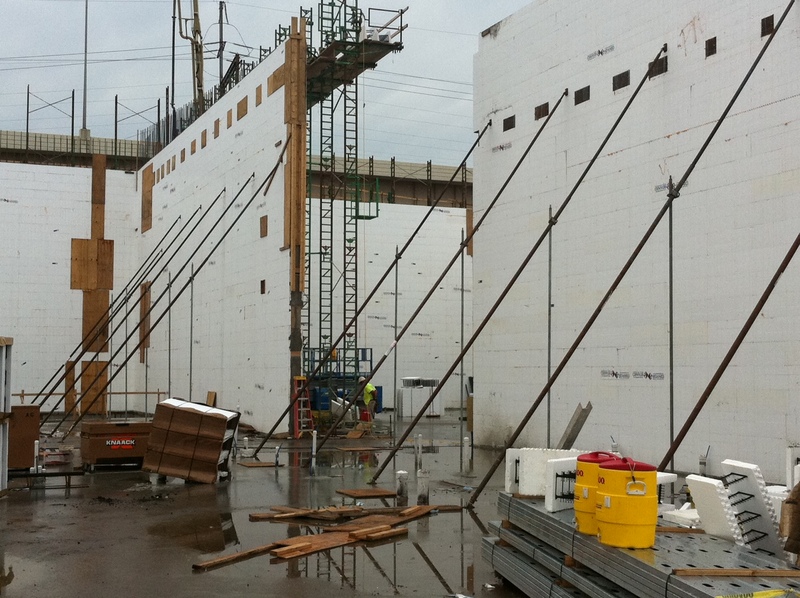 These photos really let you see just how TALL the Imax walls are! You can see why the vertical bracing is needed for support. Look carefully and you will see humans in and around the photos for perspective. 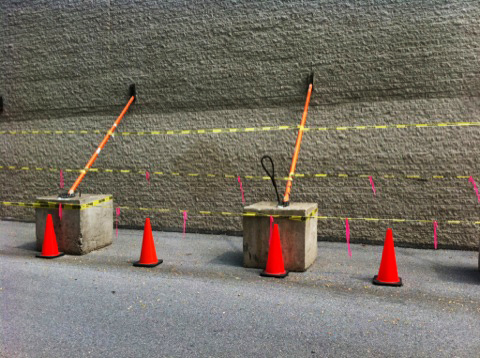 Give us the correct number of workers in the shots and you could WIN a Pinnacle T-shirt! Like us on facebook and leave your answer in the comments and 10 people will be chosen at random from the correct responses. Good luck. 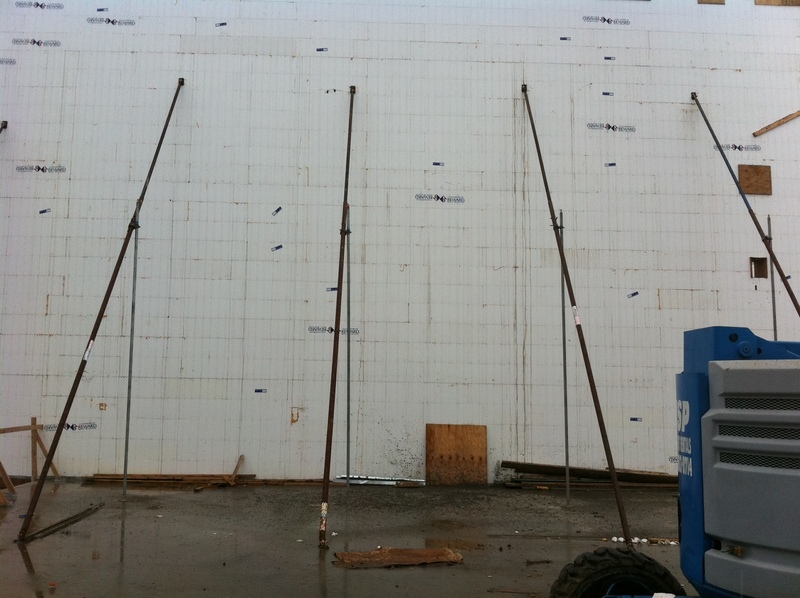 PSC did a very unique shoring system called a tilt up wall bracing. 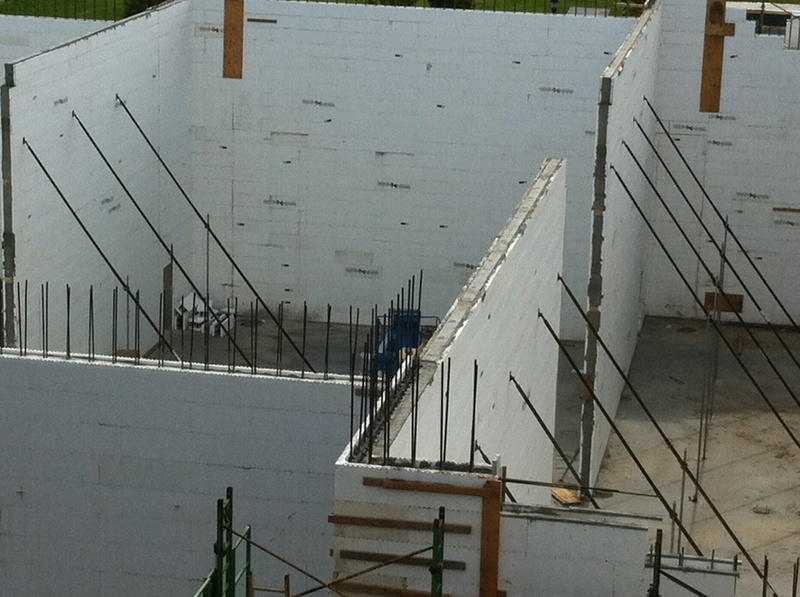 As you can see from the photos this is not your normal shoring system. 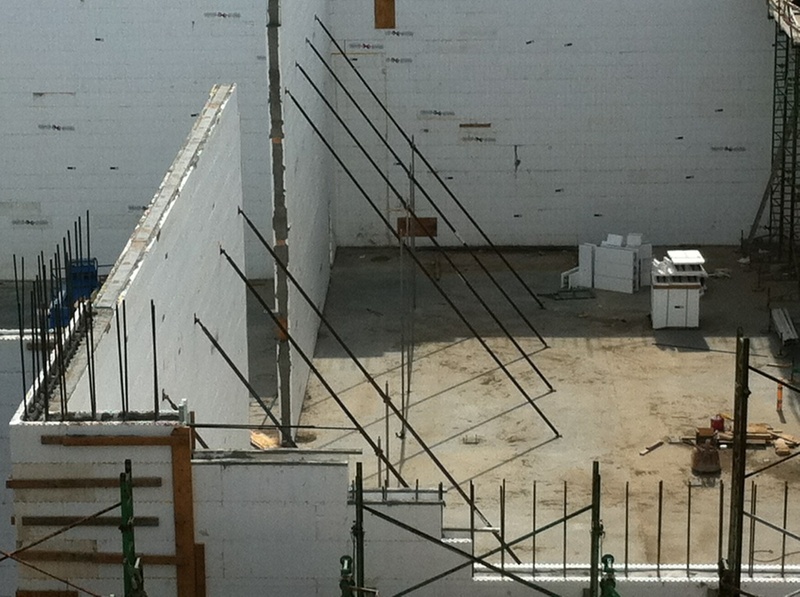 It’s used specifically when the walls are really tall – some as high as 40’-50’. It’s designed to keep the walls in place until the ceiling is put on. This system had to be used to accommodate the enormous height of the IMAX screen. This is the city’s first major movie theater in several decades. With 14 digital auditoriums in addition to the 300-seat, eye-popping 75′-by-45′ IMAX theater, it’s set to anchor the new Riverfront complex. 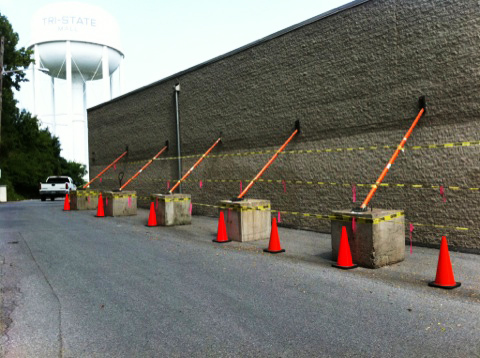 Pinnacle Scaffold emergency services team comes to the rescue at Kmart – on a holiday weekend! Late on a Thursday night while all of the other scaffold and shoring companies are tucked neatly in their beds and dreaming of how they will sleep in late and watch Good Morning America in the AM – Pinnacle is out working. At 8:00 pm Pinnacle’s emergency services team got the phone call about a wall collapsing at the Kmart at the Tri-State Mall in Claymont, DE. Pinnacle’s owner and guru, Anthony Pini, was on the job site in 10 MINUTES! Yes, he literally leaped out of his hot tub, slicked back his hair, threw on some clothes, and hit the streets running. He was at the KMART meeting with the store manager about solutions ten minutes later. 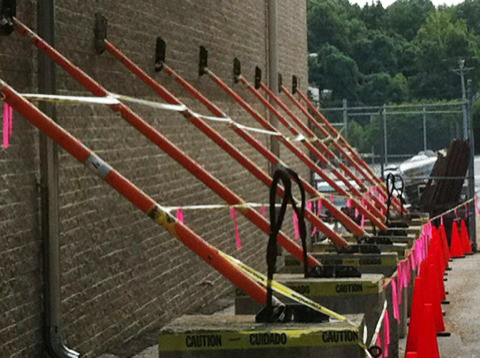 KMart’s restoration company called from Hayward, CA giving Pinnacle Scaffold full approval to come up with a solution. This happens more than you would think. Clients that are based out of state or even out of the country need a trustworthy company to literally handle all aspects of a repair job. 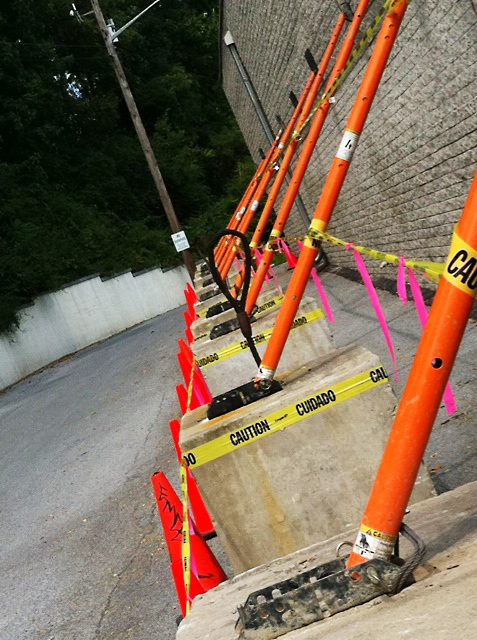 In time sensitive situations, like this, it’s easier to find a reputable company that can be their eyes and ears – and as a full-service scaffolding, shoring and restoration company Pinnacle has done this many times for clients. The west side of the building sits directly next to a busy section of road. Cars and pedestrians are constantly passing by this part of the building. A wall collapse could have proven catastrophic. As you can see from the photos, this was a fairly large section. The brick veneer was collapsing and it needed to be shored up immediately until repairs could be done. The very next morning at 7:00 AM, Pinnacle had a structural engineer (from Alternate Design Solutions) onsite at the KMART to write up a report and create engineering drawings for the solution. “The blacktop is not an ideal anchor for the braces so we all put our heads together and thought outside of the box,” said Pinnacle’s Anthony Pini. The innovative solution they came up with was to anchor the leg-end of the braces to large cement blocks or barriers for support. 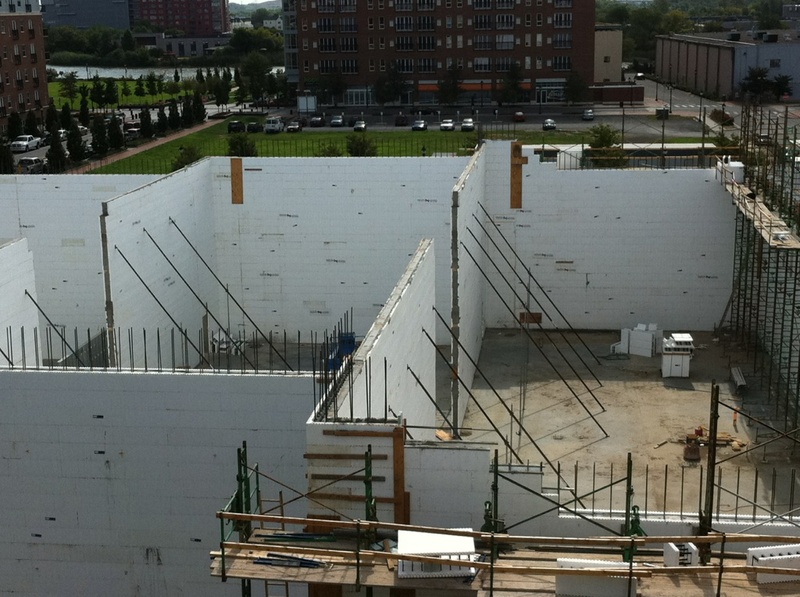 Once the plan was presented to the client and the approval was given – Pinnacle’s crew got to work. On a Holiday weekend when most people are BBQ’ing brats and hot dogs, PSC and its crew was helping KMART prevent a disaster. 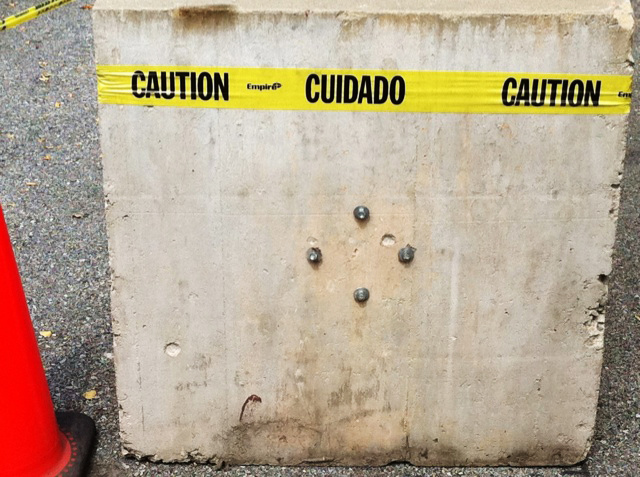 Now that the immediate danger is out of the way, the next step is to remove the brick façade, locate the cause of the trouble, and then put a new brick exterior back up. We will keep you posted with pictures and details as this job unfolds. 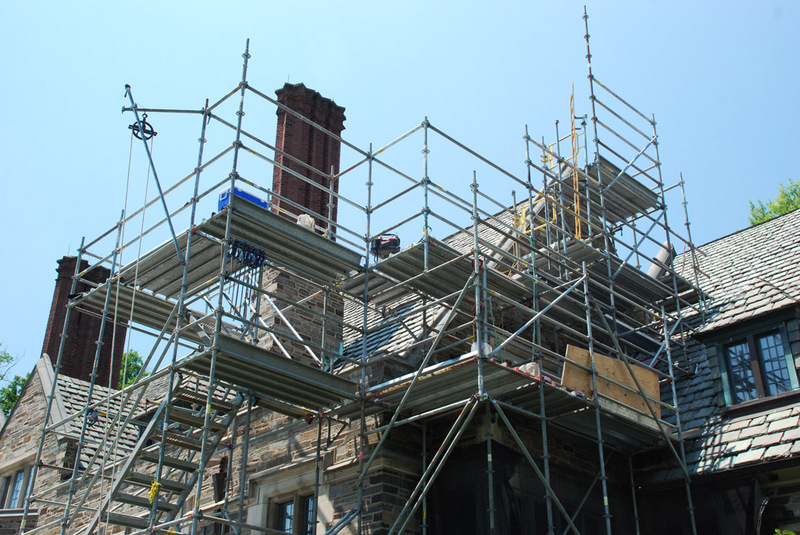 Scaffold, shoring, or restoration work – call Pinnacle Scaffold (302) 650-0520. Pinnacle Scaffold shoring division is proud to be working on the new Penn Cinema IMAX theater at the Riverfront Wilmington (the city’s first major movie theater in several decades). With 14 digital auditoriums in addition to the 300-seat, eye-popping 75′-by-45′ IMAX theater, it’s set to anchor the new Riverfront complex. 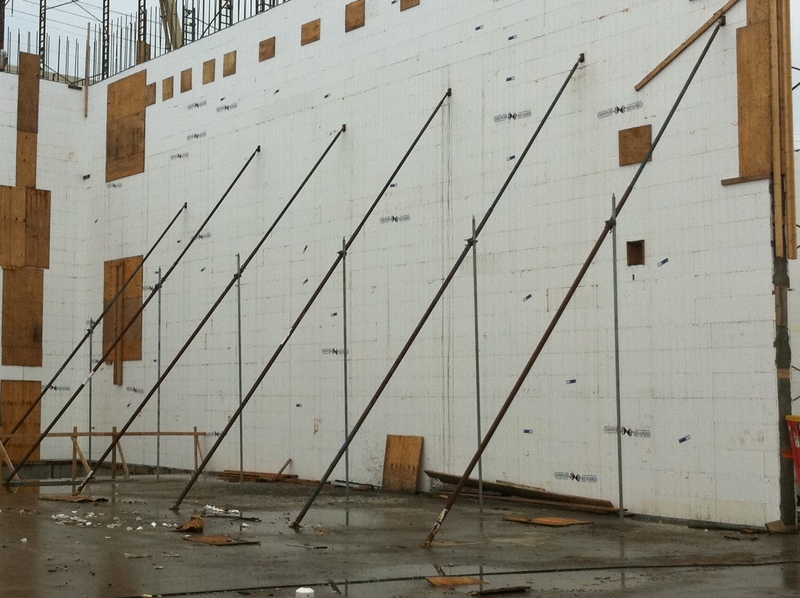 Pinnacle Scaffold is one of the few companies on the east coast who can use this type of shoring system from engineering to installation. Riverfront Wilmington, already home to a thriving neighborhood, flourishing employment center and popular cultural attractions, will add a premier Westin hotel and a state-of-the-art Penn Cinema movie theater complex with IMAX theater. The $20 million Penn Cinema Riverfront will have 15 full stadium seating auditoriums along with a full IMAX theater brimming with the latest digital film technology. The large scale of the building, along with dramatic lighting and timeless finishes, will serve as an anchor for Riverfront Wilmington entertainment options. 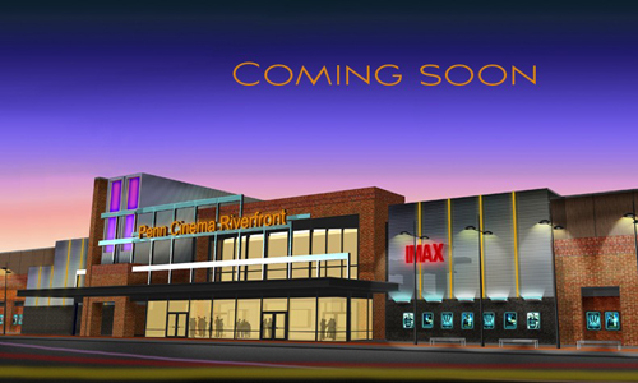 The Penn Cinema complex is expected to generate an additional 700,000 annual visits to Riverfront Wilmington. It will enhance the entertainment options at the Riverfront, which already include multiple dining options, museums and the Wilmington Blue Rocks. 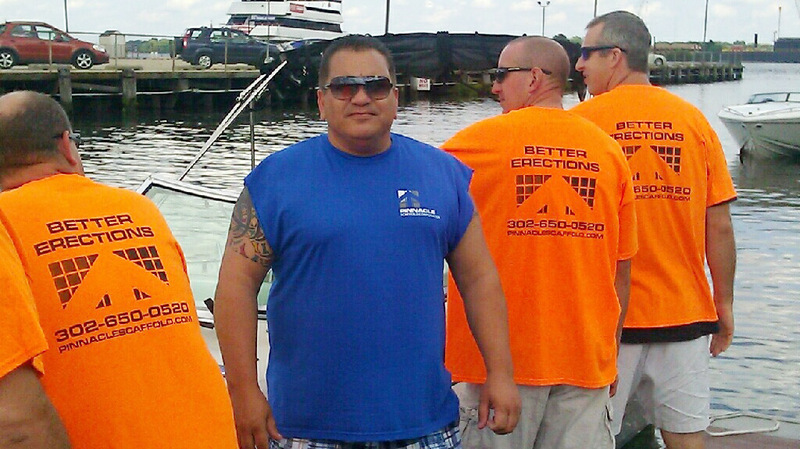 In a move sure to go down in history as one of the finest moments on water, Pinnacle Scaffold took out one of its clients (Alternate Design Solutions) for client appreciation day. The plan was simple. Entertain some great clients. 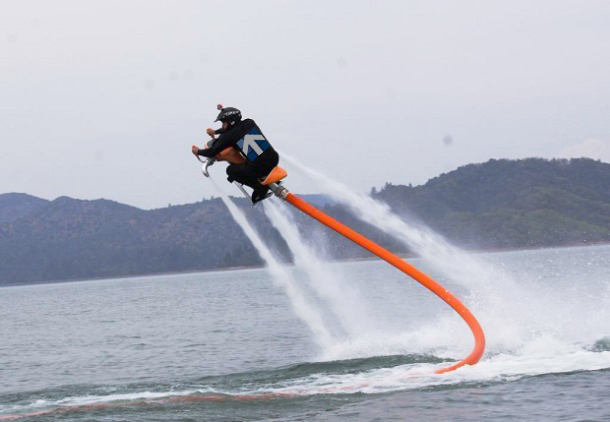 Zip around on some cool toys. Drink some frosty beverages. And even have a fishing contest. But things didn’t quite go as planned. Sure, the first toy up was the brand new Jetovator. (Akin to taming a full blast fire hose) and that was a burner. But little did anyone know just how much energy it took to ride this contraption. Working harder than coal miners to tame this wile water beast, the guys got mighty tired and hungry. Ah, the fatal flaw was found in otherwise perfect plan. Pini forgot the food. Now most times Pini and Pinnacle prepare for everything, except for on this fine occasion, where he only brought 3 Snickers and small bag of Doritos. He remembered the beverages but didn’t count on these manly men to get so hungry so fast. 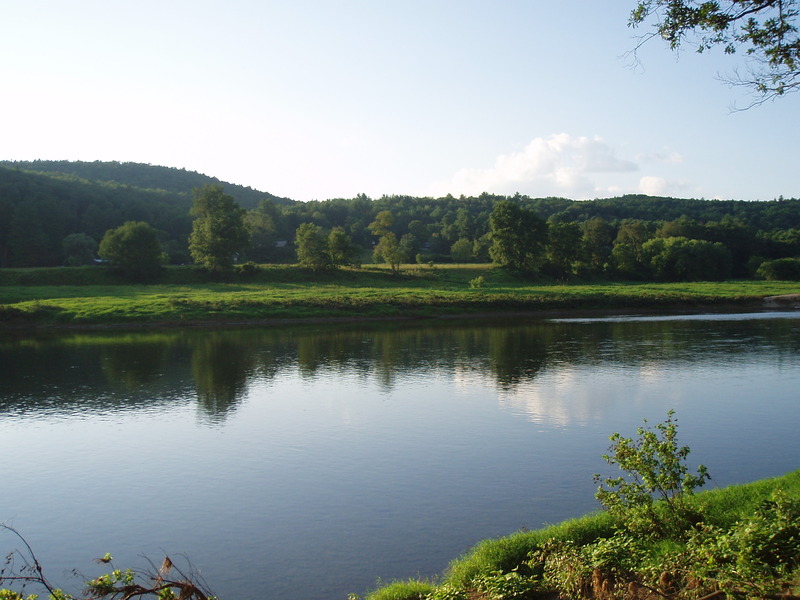 So what started off as an exceptional day on the Delaware river soon became mayhem when the starving crew ravaged the boat for anything to eat. 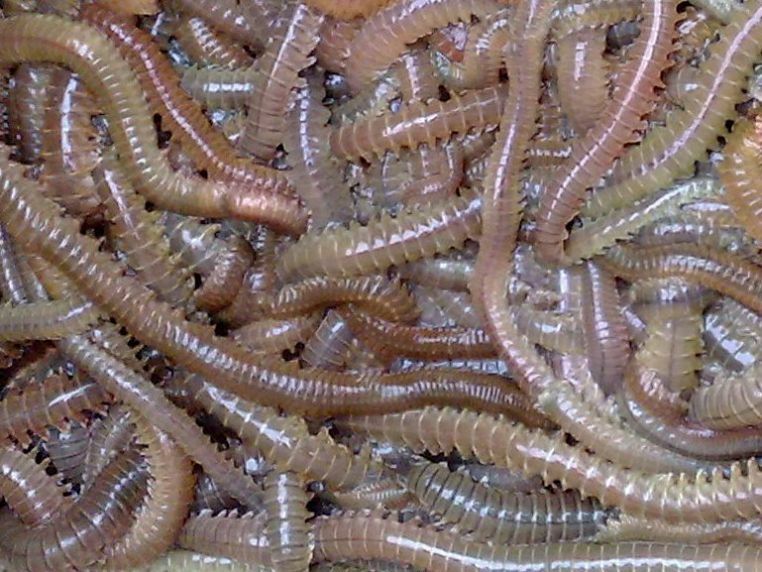 Consuming the candy bars in exactly thirty seconds and then finding no more human food, Matt busted out the live fishing bait, consisting of worms, grubs, maggots, shrimp and minnows and began feeding it to everyone. He failed to read the fine print (imported from China in 2009). No one cared. It was food and they were starving. 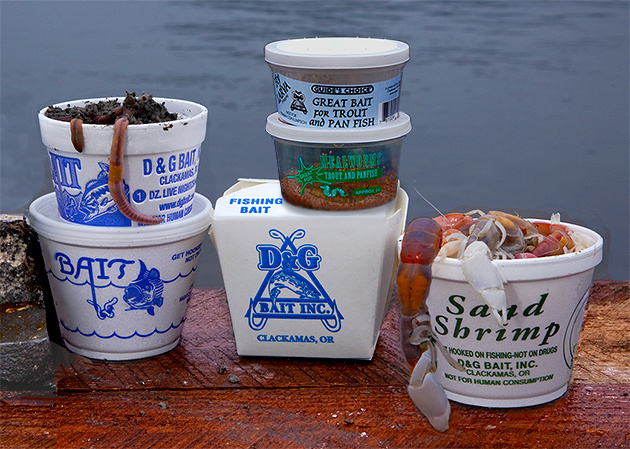 They consumed almost all of the outdated bait that was stored in the galley. This seemed to calm everyone’s hunger pangs. There was a collective sigh of relief. After about five minutes everything settled down. The colors seemed brighter, their moods got lighter and their senses seemed to be more acute. So after chugging a few adult beverages to wash the rotting fish taste, the day could continue. Pini captained the boat to a remote section of river where fishing rods were taken out and the very last of the bait was put to good use. Let the contest begin. And there could only be one winner. Pauly D defeated all anglers with his pull of a giant Tigerfish! 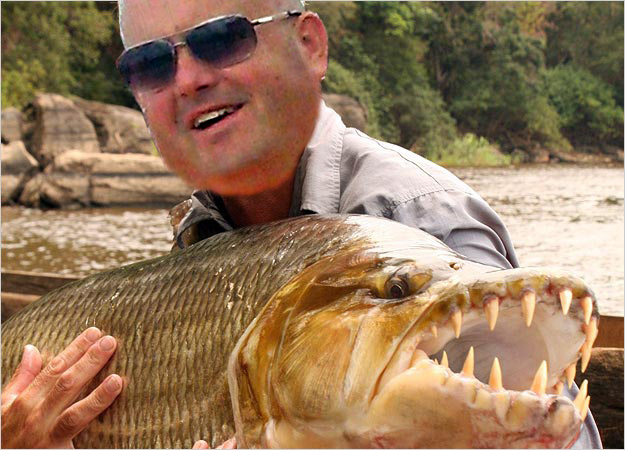 Goliath Tigerfish in Delaware you say? Incredible indeed. Thank goodness no one was injured bringing in this bad boy. No net needed. Pauly D just shoved his fist down the monster’s gullet (as if he was hillbilly hand fishing) and hoisted him on board. They would ride him later. Leave it to Pinnacle to find the most isolated spot on the river to catch fish, when low-and-behold, from out of nowhere, sped the one and only Australian Super Model, Elle Macpherson on water skis! With much grace, skill, and dynamite looks, she blasted past the boat leaving the men wet, awestruck and dumbfounded in her wake. But she was too fast and it was too late. Like some apparition, Super Model Elle Macpherson was gone. For a 47 year-old gal, she not only looked good, but could really put the pedal to the metal. Where did she go? Where did she come from? As the men stood contemplating the mystery before them – another skiing beauty sped by in her wake. 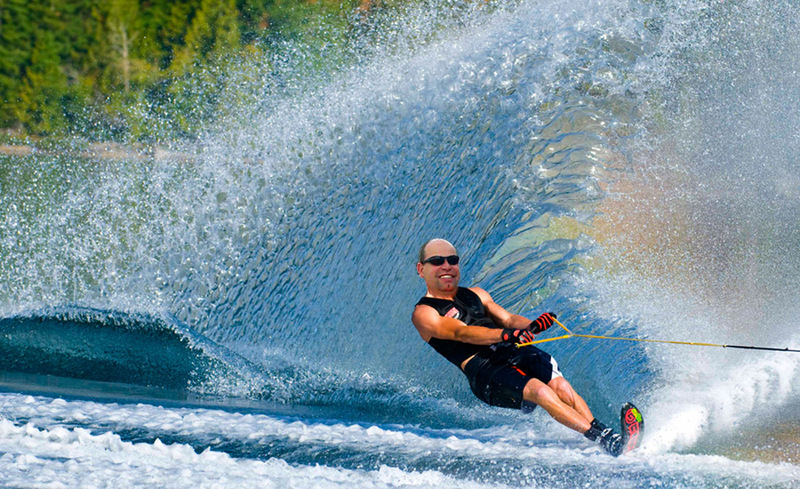 2 supermodels, on water skis in one day? In Delaware? This WAS the place to be. Or had the rotten fish heads made them see things? 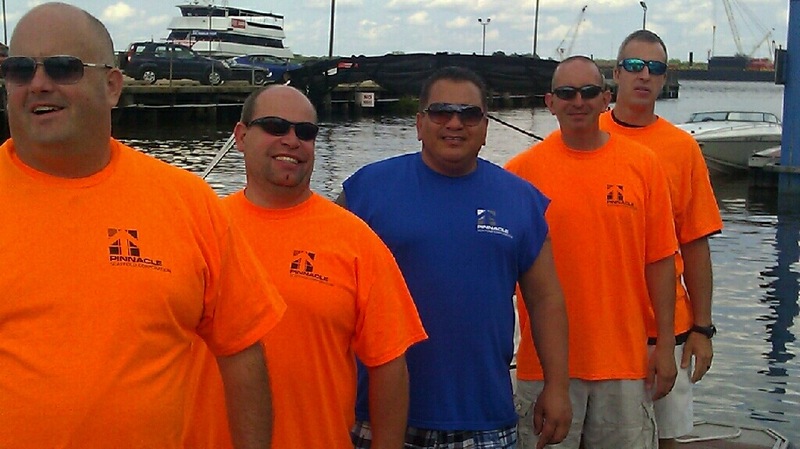 Pinnacle is in the erection business (just see their T-Shirts) and let’s just say things were getting “up air”. “Into the bat boat boys,” shouted Jimmy. “We’ll catch them. 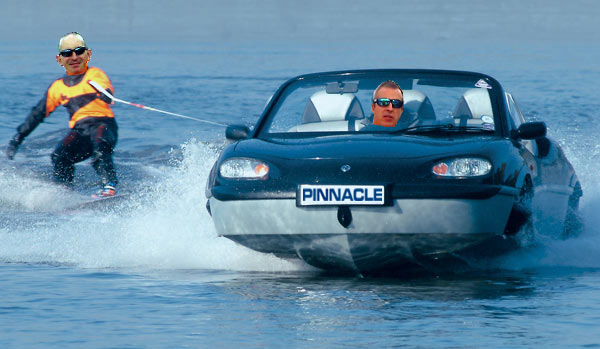 I’ve got a secret weapon,” he said, as he took the wheel of Pinnacle’s new toy – the Amphibi-car. “It might not look fast but it’s got 450 horses under the hood. Sea horses, that is. “Yah” he screamed and cracked the whip, with Paul in tow behind the speedy car boat. 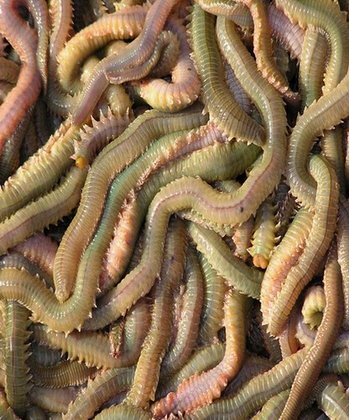 Unfortunately, after a few minutes it became apparent that no one had fed the sea horses (and they had eaten all of the fishing bait) and they just petered out leaving the guys to swim back to the boat. 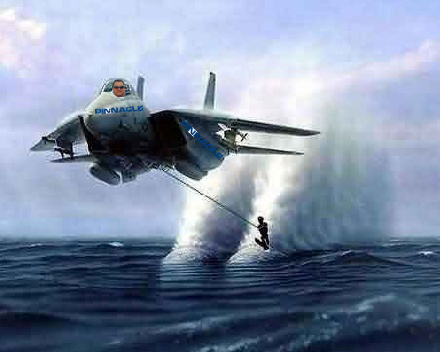 In a last-ditch effort to appease the client and find these two water skiing beauties, Pini decided to bust out the big guns. Top Gun, literally. “If we can’t find them in this – we must surely be hallucinating,” he screamed, as he rolled forward the throttle and gave new meaning to the word Jet Skiing. Unfortunately, that was the last time anyone saw the boys from Alternate Design Solutions. We can only assume that they found Elle Macpherson and her friend and are living it up on some tropical island somewhere. We hope. We wish. 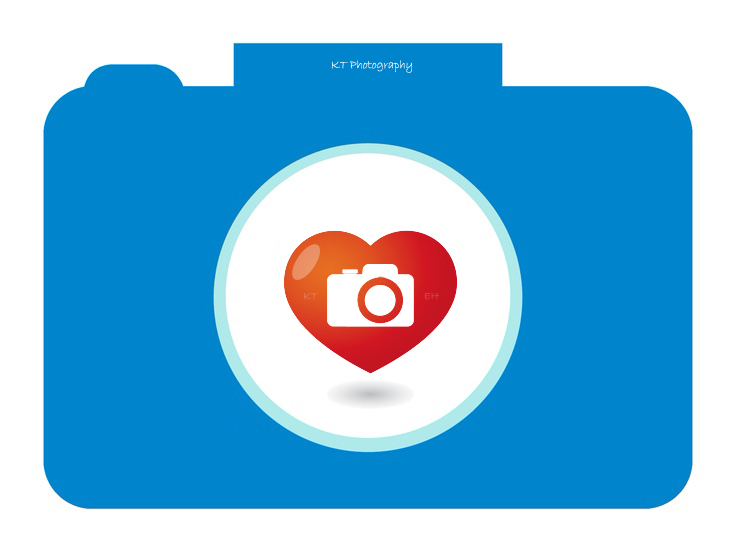 Like this post for a chance to win your very own Client appreciation day with Pinnacle. If you dare! 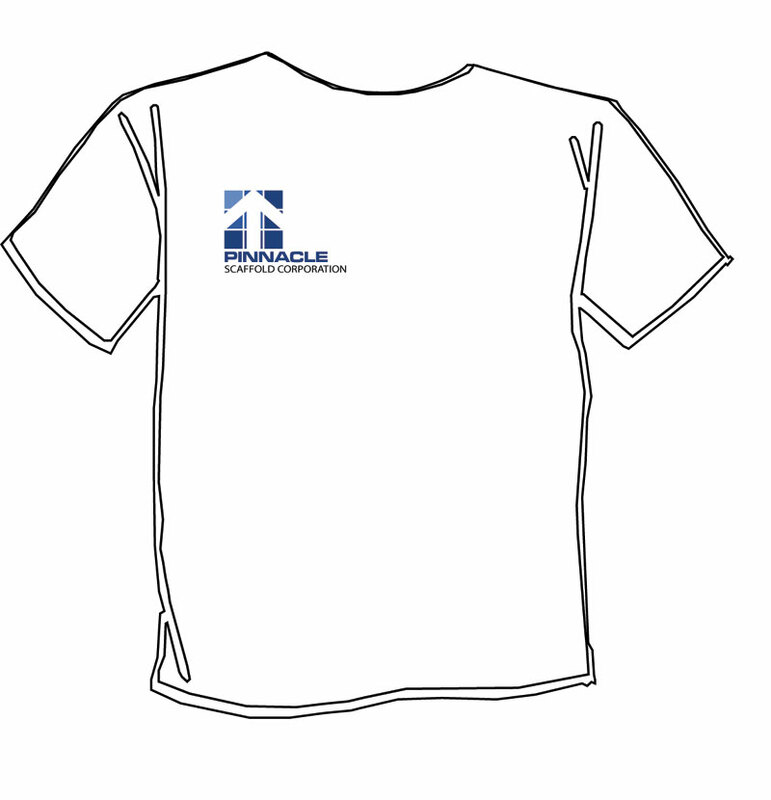 One winner will be drawn at random to have fun with the Pinnacle crew. 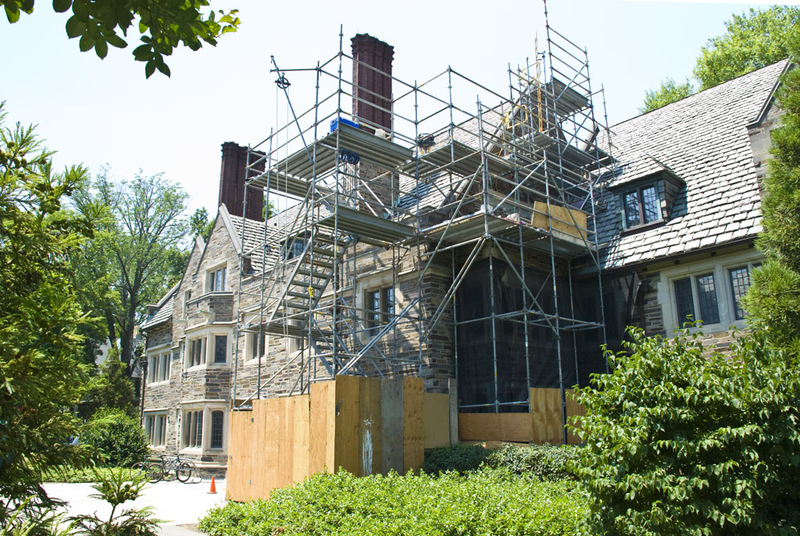 As part of our continuing relationship with the University of Princeton, Pinnacle Scaffold is proud to be working on one of the historic buildings at Mathey College. 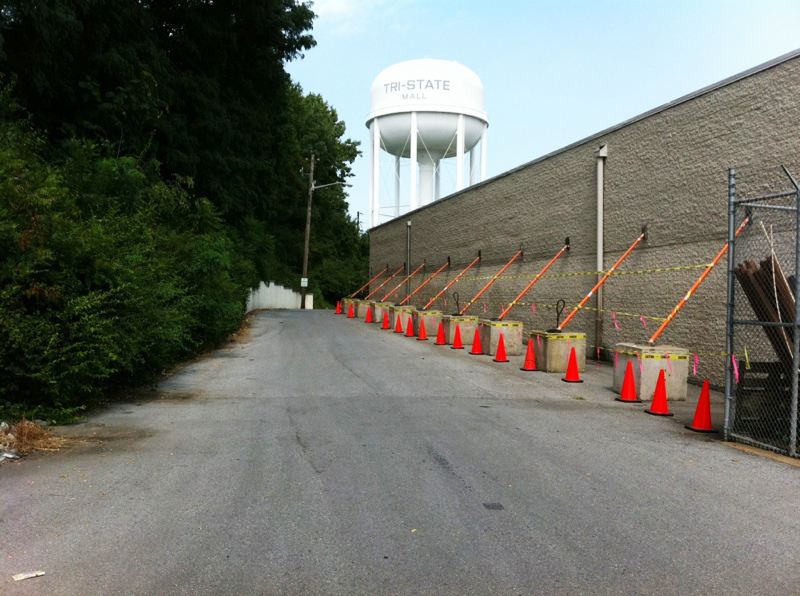 PSC takes great pride in providing the best client service possible and this job was no different. 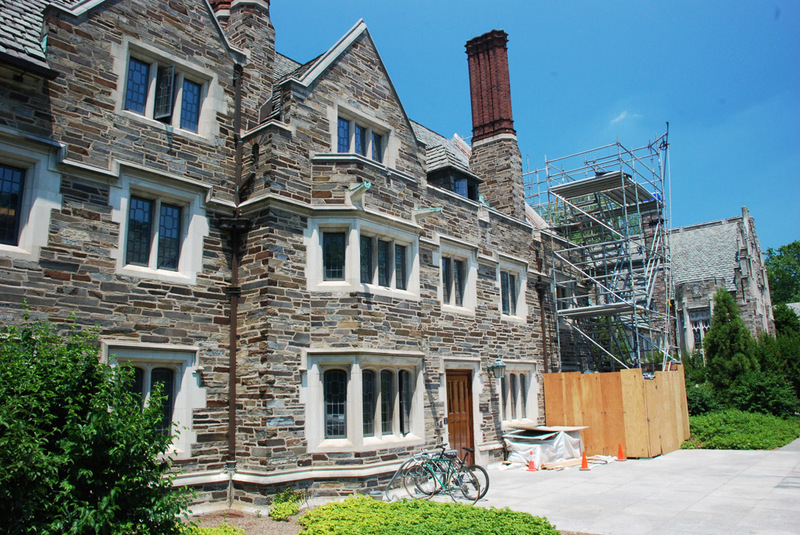 Princeton hired PSC because they knew we could accommodate some very specific requests. And on this job, we designed a system scaffold with an access way off to the right side to keep the least amount of legs on the ground and out of the very unique foliage at the base of the building. 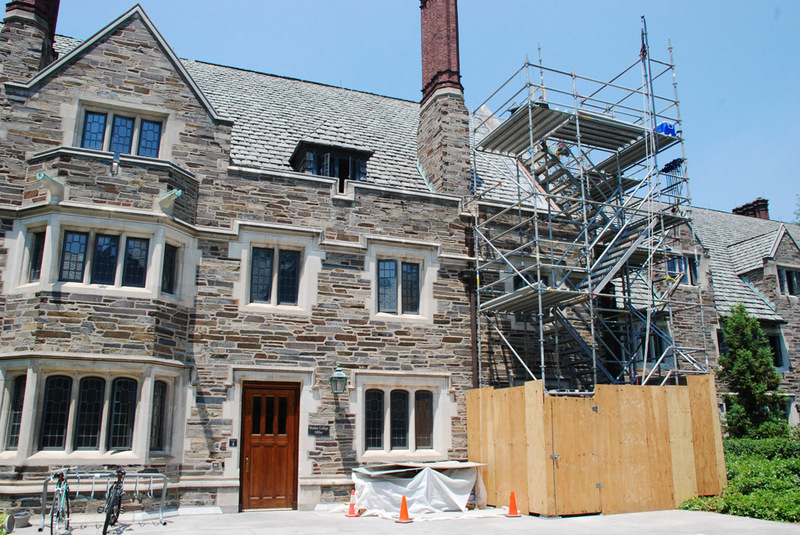 The scaffolding allowed the restoration crews access to the areas they needed while providing much needed piece of mind to the University that their foliage would remain undamaged in the process. 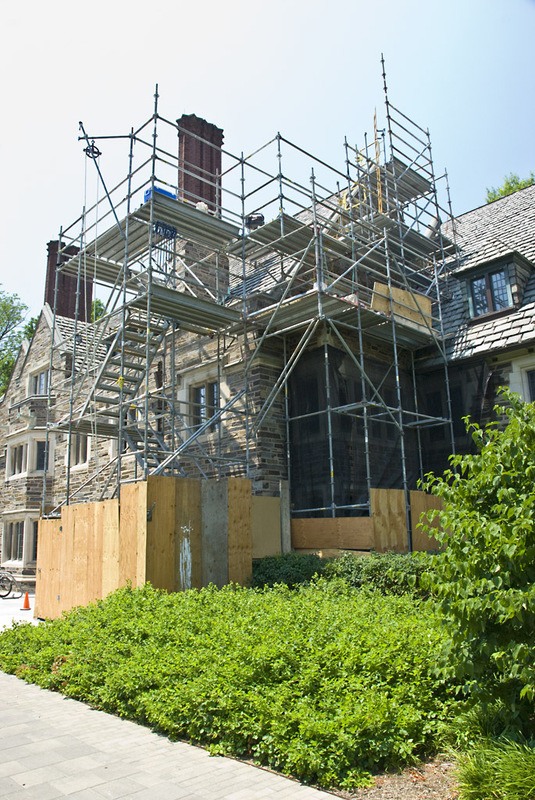 This historic building was undergoing a masonry restoration project including replacing and resetting the capstones. 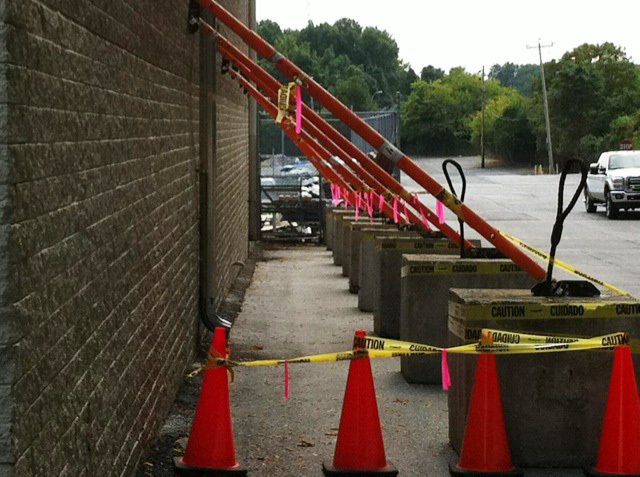 Call Pinnacle Scaffold today (302) 766-5322. Take the video tour of Mathey College here. 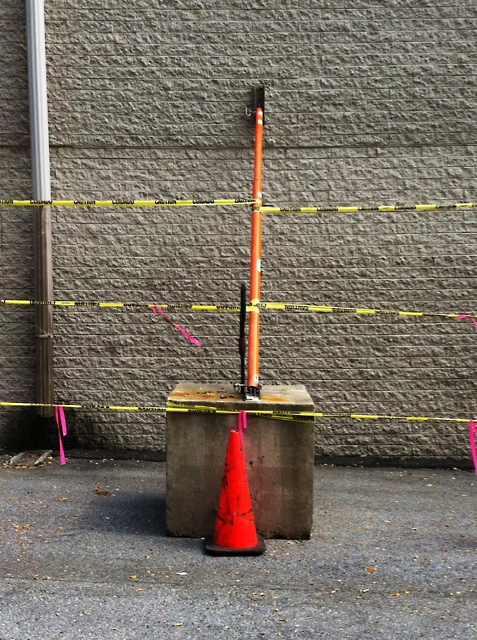 Ever wonder how people in other parts of the world scaffold their projects? 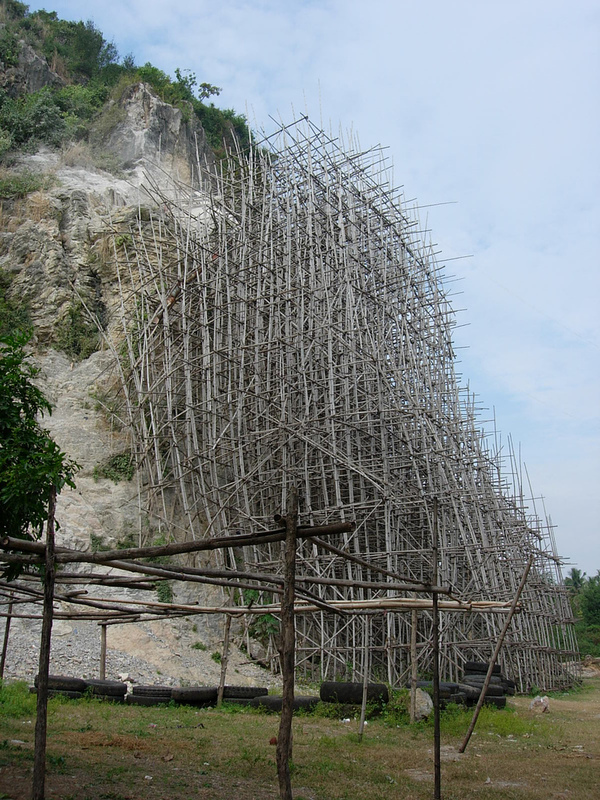 Bamboo Scaffolding. This is how they chose to scaffold the side of a mountain while carving a giant Buddha image in Battambang, Cambodia. Would you feel safe on this? Leave your comments below. 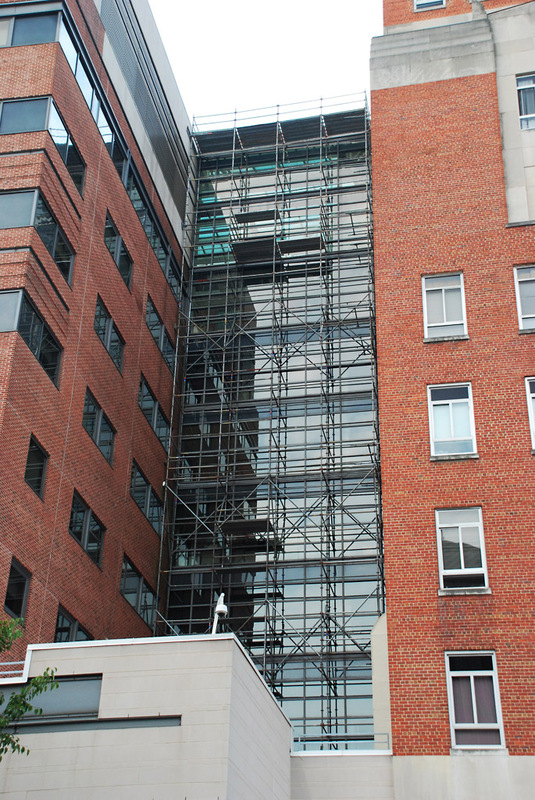 Pinnacle Scaffold (PSC) and the University of Maryland Medical Center teamed up to provide scaffolding solutions that would allow workers to complete caulking and gutter work on a scaffold that was built 100 feet in the air. The UMMC had some very specific requests and turned to PSC for solutions. 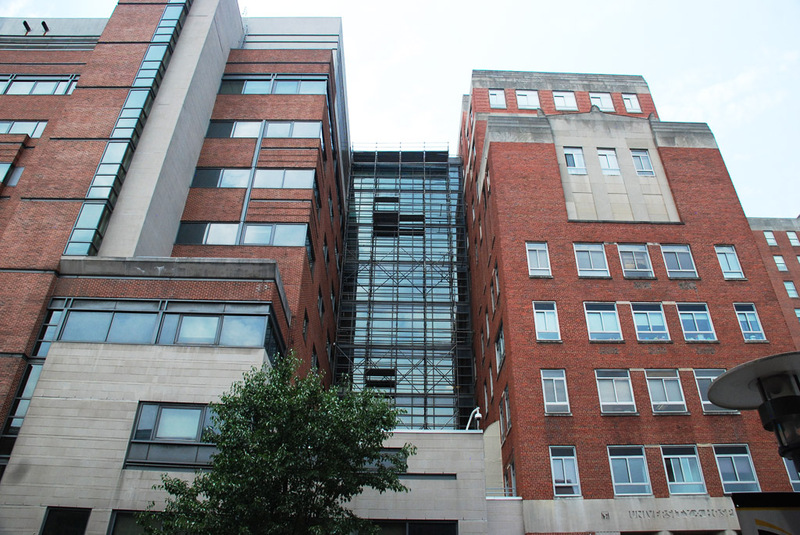 The main challenge was that the scaffolding had to be erected on top of a section of roof at the main hospital. Not only were specific weight loads an issue but business as usual protocol had to be met. 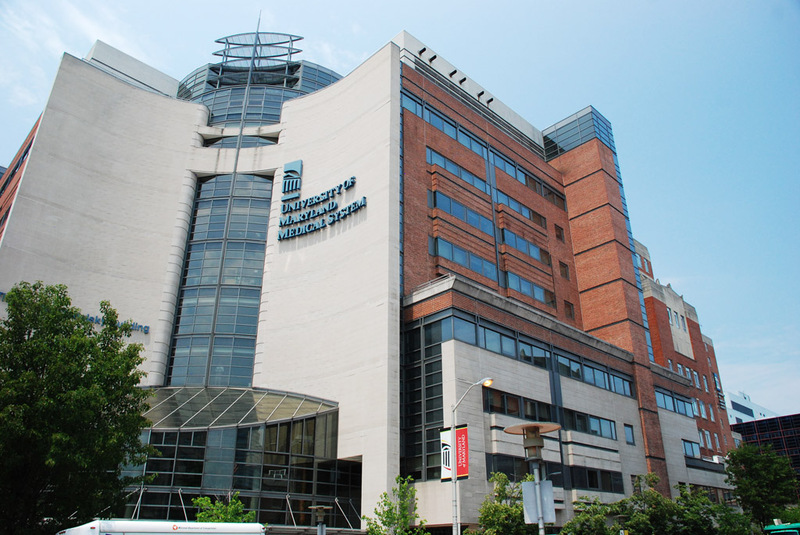 As Maryland’s top Acute-Care hospital it had to remain open for the 6500 employees and patients while the scaffold was being built. 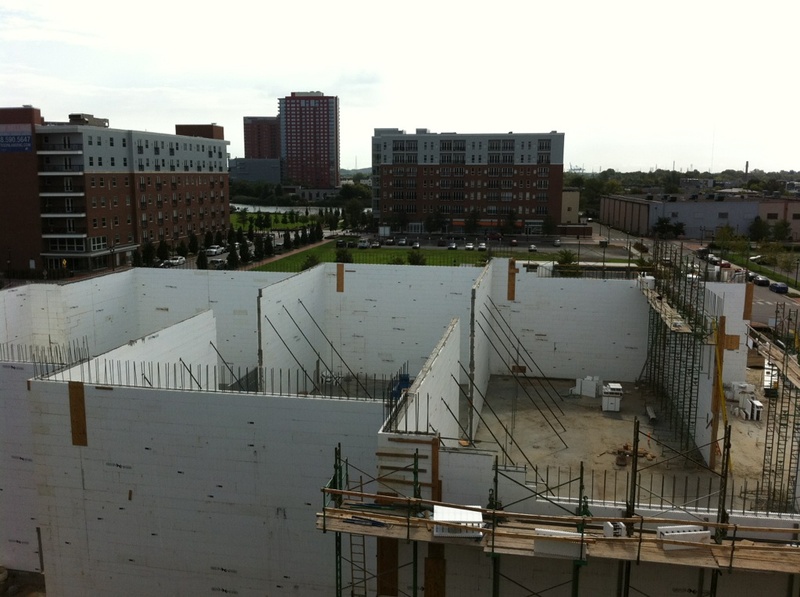 PSC came up with a lightweight system (fully engineered) sitting 100 feet up in the air, on an existing roof that allowed full access to the façade and roof.